LOCATION.--Lat 41`21'33", long 75`44'41", Lackawanna County, Hydrologic Unit 02050107, on right bank 100 ft downstream from bridge on SR 3017, 150 ft upstream from Delaware, Lackawanna, and Western Railroad bridge in Old Forge, and 0.5 mi upstream from St. Johns Creek. PERIOD OF RECORD.--October 1938 to current year. GAGE.--Water-stage recorder. Datum of gage is 595.26 ft above National Geodetic Vertical Datum of 1929. Prior to Oct. 1, 1974, water-stage recorder at same site and datum. 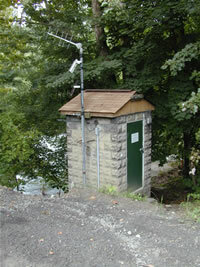 Oct. 1, 1974, to Aug. 17, 1975, non-recording gage at site 150 ft upstream at different datum. Satellite and landline telemetry at station. REMARKS.--Flow regulated since December 1959 by Stillwater Dam (station 01534180) about 33 miles upstream and since 1970 by Aylesworth Lake (station 01534490) about 17.4 miles upstream. Supplied by NWS: Action stage-7 ft; Flood stage-11 ft, some roadways near the Lackawanna River in Old Forge and Moosic begin to be affected; Moderate flood stage-13 ft, water begins to affect some homes and businesses on both sides of river; Major flood stage-16 ft, many homes and businesses begin to be affected at this level.